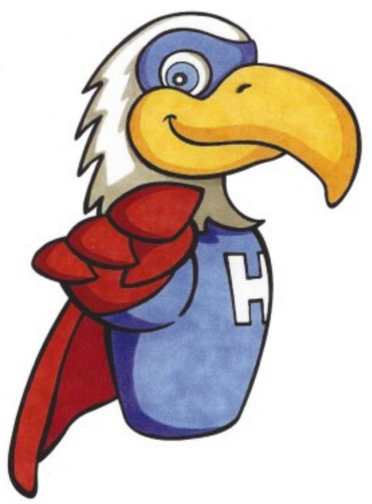 Hero is the mascot for Heritage Elementary, but he’s so much more than that. We believe that all of us at Heritage are learning to be heroes. Hero was voted as the symbol of heroism by the students. The image of Hero was created by our friend, Oklahoma illustrator, Danny Gordon. He created Hero to inspire us. Like Hero, each of us has a very special purpose and a unique voice. Eagles represent great hope and strength. We, too, want our students to set high goals for themselves and strive to accomplish them. Heritage Heroes are world changers! We never give up! Eagles are known for their amazing vision. We work to help our students become visionaries and leaders, to consider new ideas and develop confidence. As Hero flies, he teaches our students to soar high and use their energies and talents for the greatest good. We inspire, encourage and serve. Just like Hero the Eagle…Watch us SOAR!